More than half of US marriages succeed, even if many others fail. A Seattle psychologist named John Gottman wanted to find out the reasons why some marriages succeed and others fail, and see if he could build a therapy around the results. For twenty years, he videotaped couples arguing and talking. He measured their heart rates, blood pressure and cortisone levels which indicate stress reactions. After a while, Gottman was able to predict which marriages would fail with 94% accuracy. It’s a remarkable achievement, because since the start of marriage therapy, counselors have developed lots of theories and strategies to save marriages. But the rate that marriages succeed after therapy hasn’t been great: one-third of therapies succeed, one-third fail, and one-third are unchanged. Gottman’s conclusion was this: it’s not how much you fight, but how you fight and how you resolve your differences. Lasting marriages aren’t marriages where nobody ever fights, but marriages where couples have agreed to resolve their conflicts in specific ways. There are 3 successful styles of marriage. Validating Couples are good at communication and compromise. They have just as many conflicts as other couples, but they work calmly towards compromise. They do this by validating each other’s opinions (“I understand what you’re saying…”), trying to persuade the other with their point of view, and compromising often. They are not trying to “win,” but to reach a solution. Volatile Couples enjoy lots of conflict and passionate disputes. They express more positive and negative emotions. They seem to laugh more, and yell more. But they fight as equals, and enjoy the process of resolving the conflict. Conflict-Avoiding Couples minimize conflict. Instead of fighting, they agree to disagree, rarely dealing with their differences head-on. They re-affirm their shared philosophy of marriage, accentuate the positive, and accept the rest. They value separateness and autonomy. The important point here is that all of these styles work because feeling good about the process of resolving conflicts was more important than just winning or losing. The Magic Ratio of 5 to 1. Gottman discovered he could predicate marital success based on the ratio of good to bad interactions between a couple. Successful marriages needed at least 5 positive interactions for each negative one. The more volatile the marriage, the more positive interactions were needed. And when the negative emotions outweighed the positive, the marriage was headed for failure. What are the negative emotions? Criticism and contempt, defensiveness and withdrawal, loneliness and isolation. You’ll notice “anger” is not listed. This is because only when anger accompanies the negative emotions above, is it destructive. 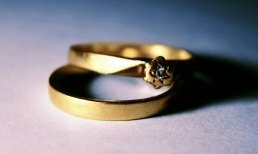 "Why Marriages Succeed or Fail... and how you can make yours last" by John Gottman, Ph.D. Call or Text Eugene Kayser at (215) 813-8633for Marriage Counseling in Montgomery and Bucks Counties.